(Bloomberg) -- The risk that the European Central Bank will lose the ability to increase interest rates during the current business cycle is a challenge for bank profitability. The cumulative adverse effect of the ECB’s negative deposit rate is part of the reason why euro-area banks are trading at a low price-to-book ratio, but there is no easy solution. 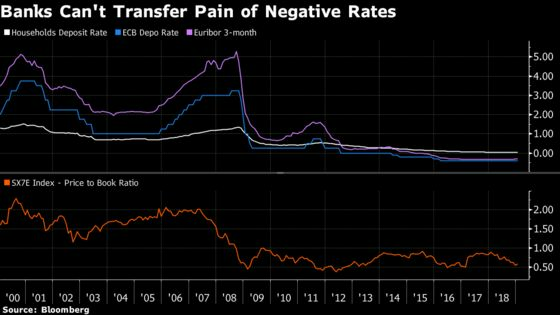 Recent comments from ECB officials on mitigating the side effects of negative rates have got markets excited about the central bank potentially tiering rates by applying a zero rate to all, or some, excess reserves as opposed to the negative deposit rate. If it took such a step, investors may see it as a signal that policy rates will stay low for longer and give officials the scope to cut rates, further exacerbating the erosion of bank profitability in the long term. 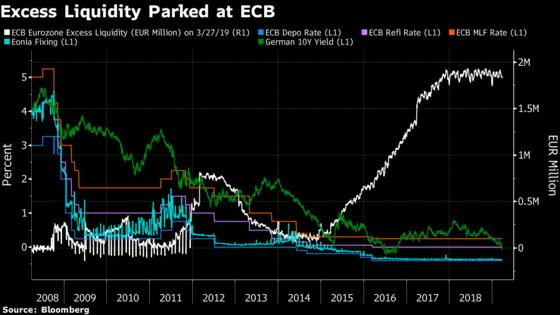 However, the idea of tiering to ease pressure on bank earnings is limited given the potential savings may only amount to 7.3 billion euros (about 6 percent of euro-area bank profits), the annual cost of the 1.83 trillion euros of excess liquidity parked at the ECB. As a large share of that excess liquidity is from core countries, particularly Germany, any gain will be skewed toward them and certain banks within those nations. Also, should the economic downturn significantly worsen, the extra boost to earnings will be more than wiped out as demand for loans will deteriorate.